The Greenhouse Worker: Teh Randy Random! Random picture of our keys for Joy's friday picture. Here's what's happening with the veggie garden! 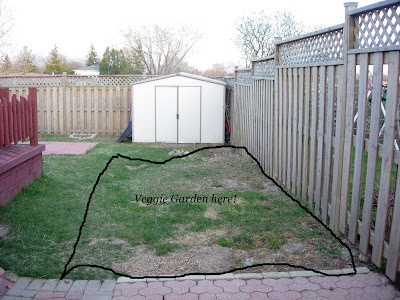 It's a good place for a veggie garden. Post a picture when all the veggies are planted. Blossom - Thank you! I will be cutting it out soon and tilling it so we'll see how it goes! Tessa - heee. Well Im thinking that's how its going to be with me too. Cutting it and tilling it are the biggest job but we have a skunk here, so I'm going to plant barberry around the whole garden to discourage him from eating my bits of fruit! Trying to save money this year! Andrea girl !! snort giggle giggle ! .. love seeing the little man's feet and toes .. takes me back to my Ian that age too ! Officially it is called :Hodge Podge" Friday ... watch me forget the whole thing when I am let loose in the garden .. right now no one has fallen off the house while "smoking" .. me not included in the smoking thing of course .. the boys are BAD ! I think I am loosing what brain cells I had before these projects started ??? HELP !!!!!!!!!!!!!!! It does weigh alot but mostly because of the iron keyes hanging off it! There's a store in Niagara falls that sells iron animals and nifty things that you can buy so I pick something up whenever im there!